Progress towards an ambitious global target to open the opportunity of the 21st Century economy by widening access to electronic transactions to everybody has been made. But evidence suggests much more work is needed to fully engage the 2bn people without access to a financial account to both access and use financial services. The World Bank is working on delivering the UN vision that everyone on Earth should have a transaction account or electronic means to store value, and send or receive payments, by 2020. This vision, laid out four years ago and reaffirmed at the G20 meeting in the spring of this year, is seen as a crucial first step to broader financial inclusion, where everybody can access credit, insurance and other services that are necessary to investing in their future and improving the quality of their lives. 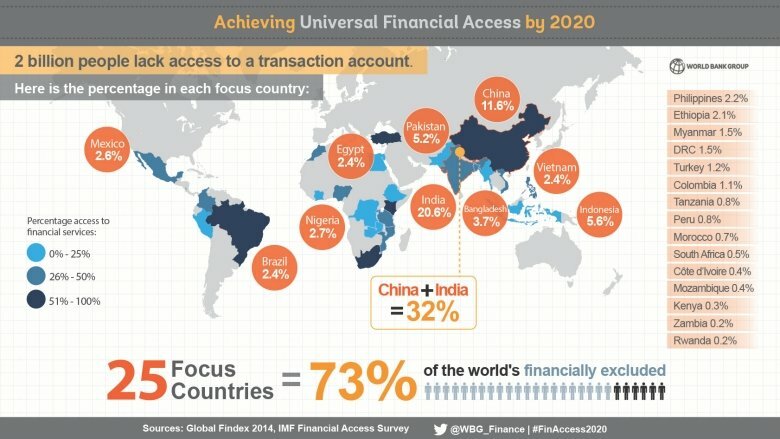 The focus on the ‘Universal Financial Access’ 2020 goal has resulted in a steady increase in the number of people able to transact without cash: up from only just over half the world’s population in 2011 to 62%, according to the latest figures. This still leaves 2bn people financially-excluded – including two-thirds of people in sub-Saharan Africa. Women are less likely to have access to an account, and to be forced to live day-to-day and not for the future. The World Bank, furthermore, emphasises that a transacting account is only the first step to full financial inclusion, which would also entail the universal provision of micro-lending, micro-insurance and other vital financial services. 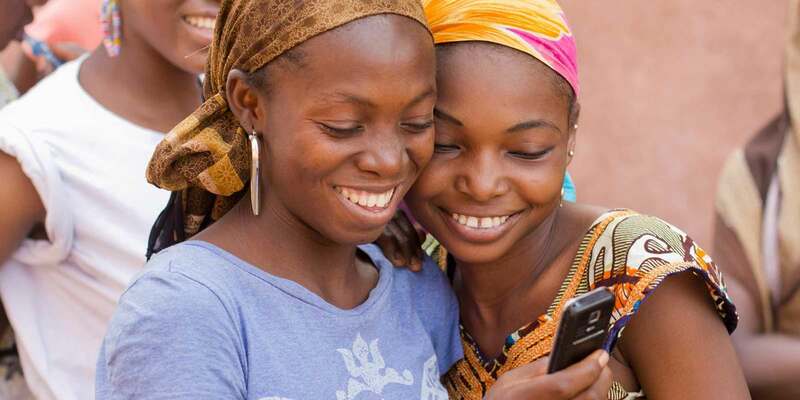 With only three years to go until the target is due to be met, the World Bank and its partner, the International Finance Corporation, have committed funds – more than $8bn USD in total – to projects to bring accounts to half the unbanked. This includes $90m USD support for Bandhan Bank to provide 38m more accounts and a risk-sharing facility with MasterCard to provide access to more than 5m accounts. Further measures will be needed, the update suggests – and there are many obstacles to full financial inclusion that remain to be come. The World Bank’s survey data suggests these include people feeling that they do not have enough money to use accounts, not trusting traditional banks, not having documentation, and not having convenient access to branches nearby. It wants a range of partners to help tackle these issues and widen access to accounts in order to meet the global goal. This includes tackling the hurdles inside and out: improving financial literacy, as well as introducing more accounts and access points. Operation HOPE, is a project that is committed to teaching financial literacy education to youth in South Africa through the Banking on Our Future program. To date, it has agreed to work with a range of institutions, from central banks to micro-insurance providers. It says there is a global trend towards diversifying the range of financial service provider types, to also include FinTech companies, mobile network operators and financial cooperatives, which it welcomes as improving consumer choice – and ultimately financial inclusion. One-third of the new accounts secured under the programme so far have not been traditional bank accounts, but instead electronic means of storing, sending and receiving value, including those offered by non-banking organisations. With the increasing focus on the market of those on low-incomes, comes a warning. The Consultative Group to Assist the Poor, based at the World Bank, has stressed that financial providers need to recognise that while those without access to a financial account may not always be in a position to vote with their feet by choosing a competitor, they do use accounts less if they do not find them to be relevant or useful. It estimates that of the over 700m accounts opened between 2011 and 2014, only half are being used, showing the massive challenge in achieving full financial inclusion where people truly are freed to create new futures. What is more, only a third of the 54m mobile accounts opened in the same period are active. This suggests that the role of so-called ‘ambassadors’ for providers working to broaden and deepen – to extend it to more people and provide a greater range of services – financial inclusion is a central one. FinTech company Humaniq is one start-up that has an ambassadors programme, which involves people within targeted regions leading engagement themselves. The potential prize of such efforts: growing trust, greater active use of financial services, and a more flourishing future for people in emerging nations. Thought leadership series on financial inclusion, new trends and blockchain, powered by Humaniq. Lee Baker is a storyteller and community organiser who inspires and prepares people for leadership. He trained as a journalist after writing his first article at the age of 13 and gained a Masters in Modern and Contemporary Literature. His journalism is designed to help influence better policy-making and he works with change-makers to tell their stories to communicate how others might follow. He is a south Londoner who has supported people to confront those in power in Brixton and win changes. He set up his own social enterprise driven by the belief that everybody can demonstrate leadership. He has designed and delivered training courses to help unleash this potential.